Bonwin's BWEPC437S visual electronic peephole system (split type) overcomes shortcomings of the traditional peep hole: limited display, inconvenient observation and so on. It provides guests with high-definition of the visitors' image, and you can switch the images freely. Any anti-peephole devices will fail facing BWPC437S. If you own this wonderful door peephole in your hotel/house, your safety and high grade will both be enhenced to a new level! Bonwin's door peephole is of small size and can be installed easily. Its camera is made of metal shell, making itself safe and strong. What's more surprising is that you can observe the situation outside freely and in a wide angle when touching the button. The peephole will shut down automatically after working for 40 seconds insated of manual operation, giving the guests more convenience. It uses cover-line or hinge line to protect power cable or/and video cable. 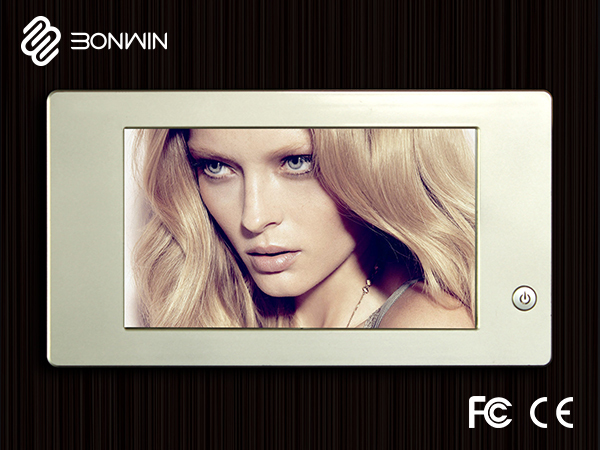 According to most high-star hotels’ requests, Bonwin developed BWEPC437S visual electronic peephole system (split type). It overcomes below shortcomings of the traditional peephole: small peephole, inconvenient observation and etc.. It provides guests with high-definition of the visitors’ image, and you can switch the images freely. It’s easy and convenient to use the door peephole. You can see the visitor’s clear image through the large LCD screen. With the AV output function, it can display the visitor’s image through the TV screen. Also, the images will switch to the LCD display on the peep hole once you press the touch switch. Turn on the switch on the hotel electronic peephole viewer, the visitor with permission can unlock the door. It’s completely eliminate the situation that someone use “Anti-peephole” device to peep the room, giving tight protection for guests' rivacy life in the room. This electronic peephole let the guest feel more safety and warmly and it’s can attract more guests to re-book the hotels room. As the guest control host RCU provides low-voltage DC power supply to the peephole, you don’t need to exchange the battery. 1) easy to use, the visitor's image is rendered perfectly through color LCD screen of the peephole. 2) AV output function, visitors' images can be clearly displayed through the TV screen. If the guest is near the door, he can also press the visible touch switch of the peephole, and the visitor's image will then be switched to the peephole 's screen. 3) the iPad screen is equipped with an unlock button for guests to open the network door lock. 4) Provide professional services to guests, as a bright spot and selling point of hotel, and attract more customers. 5) Completely eliminate the peeping phenomenon of the traditional peephole, using "anti-peephole" and other peeping equipment, effectively protect the privacy of guests. 6) The guest control management host RCU provides low voltage DC power, eliminating the need for frequent replacement of dry batteries.